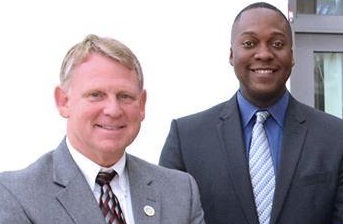 Republican Howard County Executive Allan Kittleman holds a wide lead over his Democratic challenger, County Councilmember Calvin Ball, 53% to 37%, according to an independent media poll taken this week by Mason-Dixon Polling and Strategy. The poll by Mason-Dixon Polling and Strategy, found the incumbent has “overwhelming support” among Republicans (90%-6%), a wide lead among independents (55%-29%), and “strong crossover appeal” among Democrats, picking up a third of likely Democratic voters. Mason-Dixon was founded by Brad Coker in Columbia 30 years ago but is now based in Jacksonville, Fla.
“His lead among young voters (18-34 years old) is a mere 46%-44% and he trails among women by 50%-38%,” Coker notes. The pollster interviewed 625 likely Howard County voters using land-lines and cell phones that matched a voter registration list. It has a margin of error of plus or minus 4 percentage points. The questions about the county executive were tacked onto a poll for “a public policy client in Howard County with no connection to county partisan politics,” Coker said. The results of the client’s poll will be released next week, he said. The questions on the executive race “were added by Mason-Dixon® for our private use,” said Coker. “The primary reasons for Kittleman’s success are his personal popularity (60% favorable name recognition) and the perception that he is doing a good job running the county government (63% job approval rating),” the pollster says. 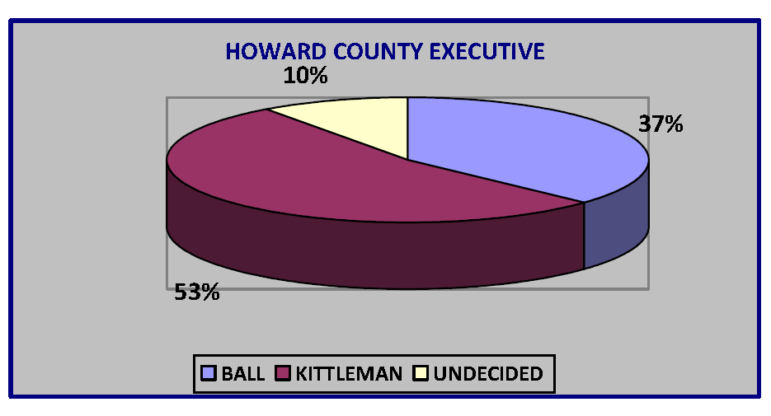 One surprising result was that Ball’s name was not recognized by 22% of the respondents despite serving on the Howard County Council for over 12 years, including several terms as chairman. Mason-Dixon also polled by County Council District. In the County’s two traditionally Democratic council districts, “Ball’s leads are far narrower than average,” said Coker. He is ahead in his own 2nd Council District by 52%-41% and in the 4th Council District by 47%-42%. Meanwhile, Kittleman is carrying the traditionally “swing” 3rd Council District by 51%-36%. He is also winning the traditionally Republican council districts by wide margins – carrying the 1st Council District by 62%-27% and the 5th Council District by 69%-23%. Here is a link to the full results of the poll and its methodology as well as Coker’s analysis.